Aging has its downfalls. On this travel course, while I still out do some of the students (I love to walk), my back is in pain after a few days on uneven pavement, and I keep a slower pace when climbing, such as the walk to the castle in Salzburg. But there is a real joy and beauty to having a perspective that spans decades. I was first in Munich in 1982. As I looked at the train station and imagined it then and now, it struck me that the changes reflect cultural shifts. More consumption, more fast food, everything more colorful and electronic. There is now an electronic billboard where the old train arrival/departure board stood. It flipped numbers and letters to change, now a big screen simply lists the trains. 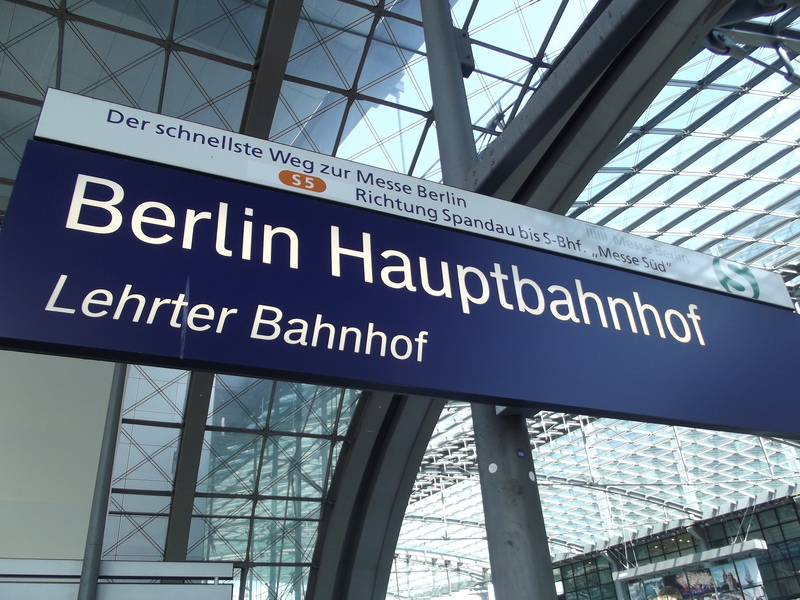 I was in Berlin for the first time in 1989 – late July and early August. In retrospect, I was there literally in the last days of Cold War “normalcy.” I was fascinated by the ride through East Germany, observing villages with TV antennas atop the homes, cars covered so deep with soot from the huge factories near Bitterfeld and Wittenberg that one would need to brush it away like snow in the winter. Going to East Berlin I was shocked by the economic conditions – the central store on Alexanderplatz had nothing worth buying, and that was their showpiece department store! I ate lunch, walked and observed. I can’t describe the emotion I felt when I walked down Unter den Linden to the east side of the wall. I could see observers on a platform in the west looking over. The division of the city was absurd. Little did I know, it was also going to last only three more months. 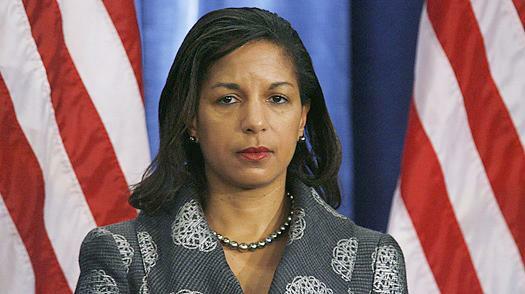 In early August, no one knew what was about to happen. To think, the Cold War, the Wall, Communism…those are abstractions for anyone under 30 in Berlin. It’s history, stories from their parents. Their reality is smart phones, social media, the Euro (it’s been 12 years since they used the Deutschmark) and globalization. I see that in my students too. Most had never heard for the 1972 terror attack at the Munich Olympics (we discussed that while visiting the Olympic grounds and tower), their questions about the division of Germany and the Cold War show most don’t really understand what it was all about. Their reality is much different than the reality of my generation. The wall, once the real symbol of the Cold War – the Communists had to build a wall to keep citizens from fleeing their “farmer and worker paradise” – is now an odd historical curiosity for the younger generation. This is the “East Side Gallery,” a replica of the wall, with new and classic graffiti. Though part of me envies the fact they are young, have their lives in front of them, and are in a world where globalization offers profound possibilities and unpredictable change, I embrace the fact that I can experience these cities now with the perspective of time. I can see what’s changed and what has not. I understand how dramatically the world has changed since the early eighties, when most Germans only got three television stations and credit cards were an American phenomenon. In the 80s they were still catching up to the US, in many ways they have now passed us. In Salzburg we saw an exhibition on World War I – “Trauma, Art and War,” showing how people enthusiastically welcomed a war they would all come to hate, and which would only make things worse in Europe. 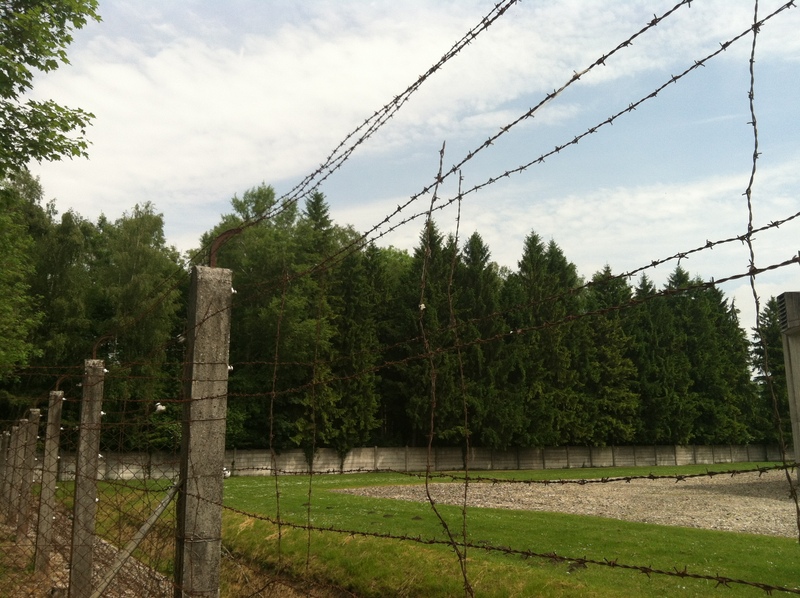 In Dachau we visited the concentration camp. The power of that place was such that I had to leave the students for awhile to be on my own, again, the emotion welled up in me and I was brushing away tears. It wasn’t just about the victims, but thinking of Germany itself, how they give in to the horror of a radical fascist right wing dictatorship. I told the students that one lesson of history is that ideology is dangerous. The far right and far left were seductive in their simplistic explanation of what would make the world better. They also each tried to paint the other as not really being their ideology – the right says that fascism was leftist, the left calls communism ‘red painted fascism.’ Now Germans embrace pragmatism over ideology, and that has put them in very good condition. I am writing this on the train between Munich and Vienna. Trains rarely have compartments any more, now it’s wide open seating. The windows can’t be opened as the trains are air conditioned. Yet there is a consistency to train travel that brings the years together for me. Gliding on the rails (even if it’s a tad quieter), the announcements, one of the conductors blowing a whistle when the doors are about to close and the train goes on, that holds the experience together across time. So much to blog about! In Berlin the power of the past still moves me. 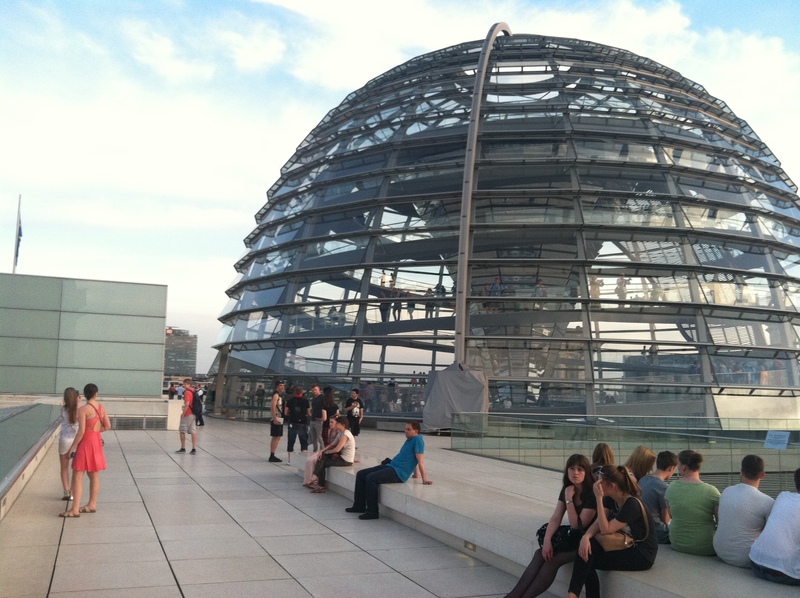 We had a theme of the history of the Reichstag (above) as a constant connecting Imperial Germany to today – and the diverse episodes of war, fascism, division, etc. – can be linked when viewed through that perspective. I will blog about that – but not today. 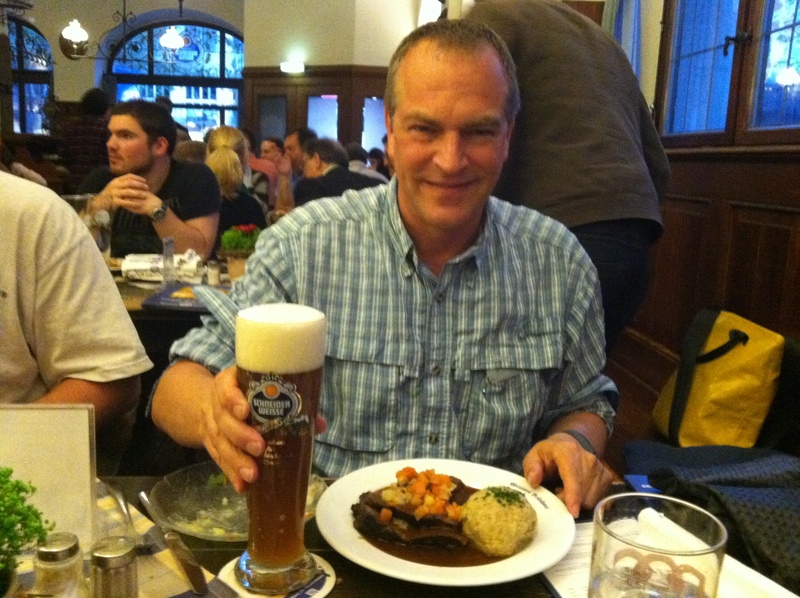 I also have started blog entries about the joy I still feel when I encountered unified, free Berlin! The changes over the last 25 years – a city in constant transition – excite and amaze me. I have at least two blog entries to write on that. Today after a train ride to Munich I gave the students a seminar that started at Odeonplatz, where Hitler’s “Beer hall putsch” of November 9, 1923 met its demise. I now joke with my students, I’ll be talking about something and I’ll say “give me the date” and they’ll yell “November 9!” That was the day the Kaiser abdicated and Germany was declared a republic in 1918, Hitler’s “putsch” attempt, Kristallnacht of 1938, and of course when the wall came down in 1989. Apparently, Germany is a Scorpio. So we discussed Hitler’s rise, then went down the street not more than a kilometer to the memorial to Sophie Scholl, my personal hero (along with her brother and others in the White Rose). At Geschwister Scholl Plaza (meaning literally ‘Siblings School Square,’ though it doesn’t sound as awkward in German as in English) we talked about her story and its aftermath. I also talked at length about the film made, “The Last Days of Sophie Scholl.” As we finished I walked by a newspaper stand and the headline on Bild Zeitung was that Alexander Held’s wife (Held played the Gestapo interrogator in the film) died from internal bleeding, and he found her dead at home. Yikes. 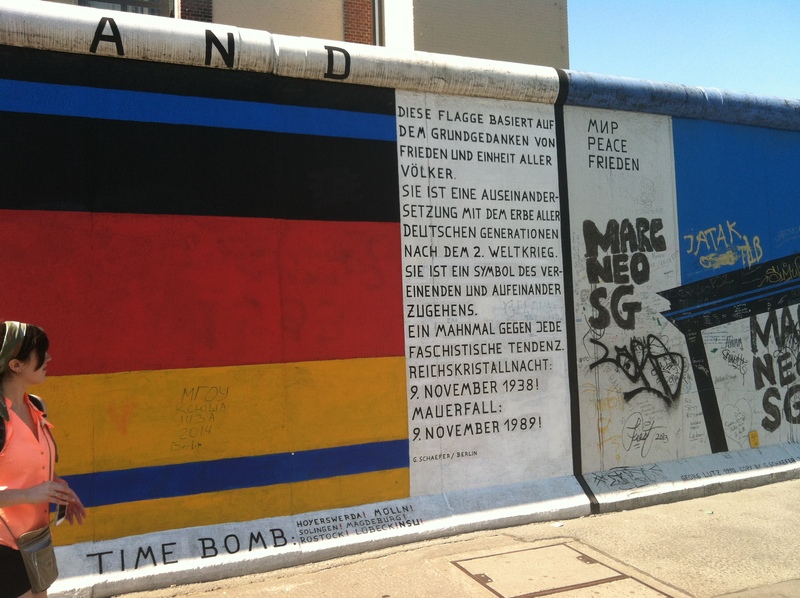 I’ve got a big blog entry to write on that, and how cool it was to use place to connect history and emphasize both the evil and good expressed in Germany’s past. But not tonight. I can’t blog and be a solo instructor at the same time. I don’t have time to craft a thoughtful blog about a subject of importance. So tonight I’m going to end with a short look at how hostels have changed. My first time in Munich was 30 years ago. I recall going to the hostel, lining up and waiting over an hour for them to open the doors and assign rooms. It was first come first serve, the doors didn’t open until 3:00. We were in a barracks like room, and had a midnight curfew – then the doors closed. There were lockers for valuables at least. In the morning one showered in a large shared shower, and then at breakfast I was handed a brotchen, slice of cheese, bad coffee, and that was it. It felt more like prison. We had to be out from 10:oo to 3 as they cleaned. But it was cheap! An awesome group to travel with! Now at Hotel Wombats the place is open 24 hours. We’re warmly greeted by staff who tell students to get their bedsheets and make their beds (they don’t allow sleeping bags or your own bedding for sanitary reasons), there is free wifi, a bar on the premises (students each got a free drink voucher), a shower in every room (though rooms can have 8 people), and a fun atmosphere. Their breakfast is a buffet style with brotchen (rolls), different kinds of bread, toasters, jams, different kinds of cheeses, salami, different kinds of meats, cereal, cukes, milk, juices, coffee, eggs, and more. Yet it’s still pretty reasonably priced! I thought of that as I walked through Munich’s train station tonight, realizing that it is nothing like how I experienced it the first time. I could see how the old station fit generally in the structure, but everything was different. There’s a blog entry about that coming up too. But not tonight – and maybe not until after the trip is done. Right now I am 40,001 feet above the Atlantic, due south of Reykjavik, likely to arrive in Dublin in one and a half hours. The computer is pressed against me and I have to squeeze my hands to my body to type – not a lot of room (of course the guy in front of me has his chair down). The flight has been good. One thing strikes me – Aer Lingus charges for almost everything but the dinner (which was OK). Usually at least wine is free at dinner, but any alcohol cost money (though soft drinks are free). That’s the first time I’ve seen that on an international flight, but I’ve never flown Aer Lingus. So I partook of soda water for my beverage – probably a good idea because I’m getting no sleep. We do have personal video screens, and I watched Catching Fire and Muhammad Ali’s Toughest Fight (or something like that – it was about the Supreme Court deciding the case against him being a conscientious objector). Catching Fire was pretty good, though not great. I loved the Supreme Court movie, mixing real clips of Ali and the news with a fictional portrayal of the court. Though Frank Langella really portrayed Warren Burger in a sinister way. Christopher Plummer was his usual amazing self. So there was a bit of memory of the film Syriana with Jeffrey Wright in Catching Fire, and Plummer in the Ali movie. The van ride from UMF was great – Kat Zachary, a recent grad, was fun to chat with, and the trip was quick and uneventful. At the airport students wondered where I was when I disappeared to a corner and posted last semester’s grades – don’t want to have to think of that while we’re in Germany. It seems like a great group of kids along – only three males, ten females, and they seem very eager to explore Germany. We have a relatively short layover in Dublin, and then it’s on to Berlin! I’ll blog again when I get the chance! One of the joys of teaching at UMF is the ability to offer travel courses, usually in May term, winter term or February break. 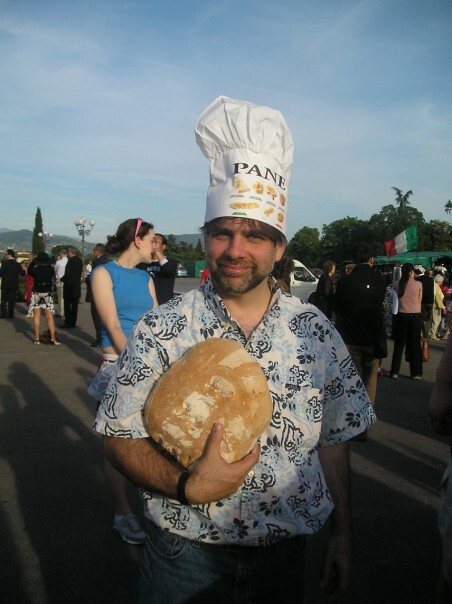 My first one was back in 2000/01 over winter break with 20 students to Italy. That was back when the US economy looked super strong so the Euro cost only 78 cents. The Italians still used the lire, but already the European currencies were locked in the Euro rate, with Euro coins and notes taking over in 2002. The dollar was so strong almost everyone on the trip bought leather jackets in Florence, ate out a lot, and had a small trip fee (for hotel, flight, and train) of $1250. In the winter of 2003/04 I lead 18 students to Germany, going to Weimar, Berlin, Koeln and Koblenz. At that time UMF had only one other professor offering travel courses, so this was new territory. Now there are probably ten or so a year, and the university is trying to expand them. 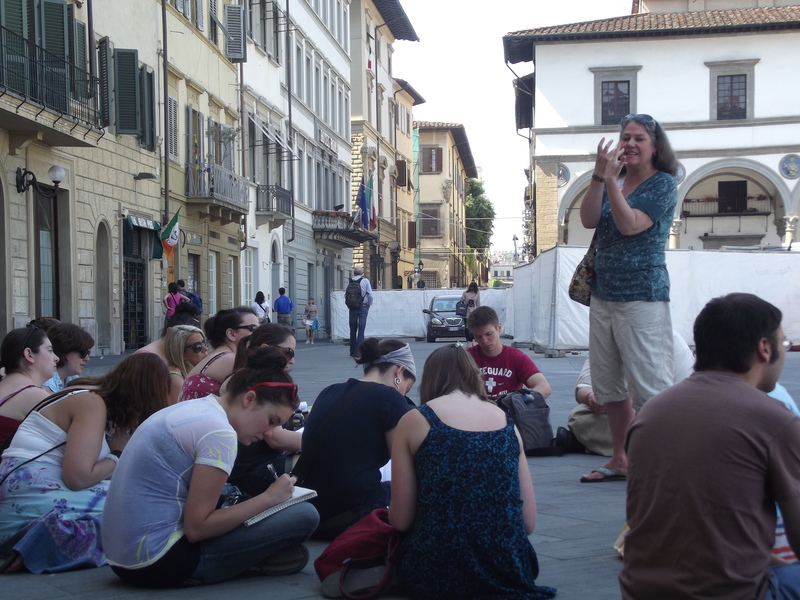 In May 2005 I joined three other professors – Steve Pane from Music History, Sarah Maline from Art History and Luann Yetter in Literature – to offer a multifaceted course to Italy, visiting Venice, Florence and Rome. We had nearly 40 students, and the trip was amazing. We reprised that trip in January 2006/07, February break 2008 and 2009, May 2011 and May 2013. In February 2009 and May 2013 only two faculty members could go since we didn’t have so many students (Sarah and I in 2009, Steve and I in 2013). We’re hoping to have enough for all four of us to go again in 2015. 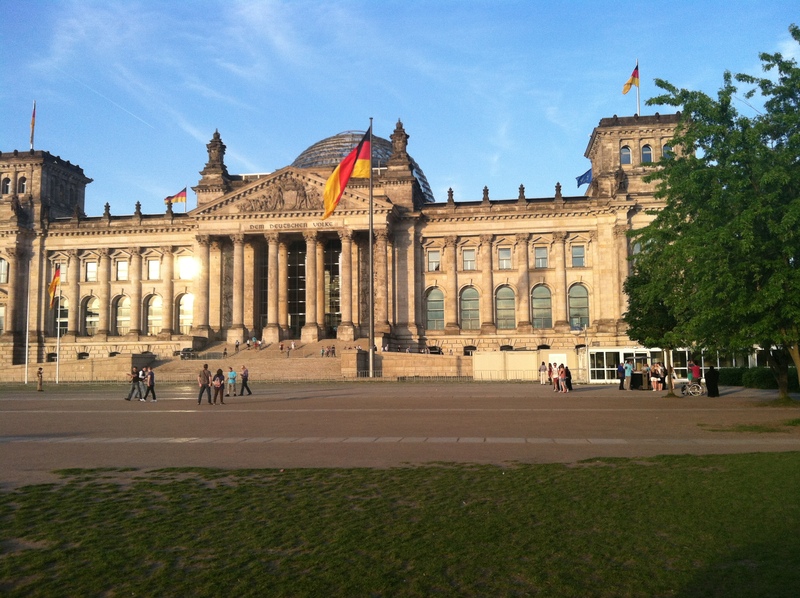 Steve, Sarah and I did a Vienna-Munich-Berlin trip in 2010, and I lead a solo trip to Berlin, Bonn and Munich in 2012. So this Monday when I lead a solo course to Berlin, Munich and Vienna, it’ll be my 11th travel course. They are a lot of work – organizing the itinerary, booking hotels, airfare, trains, etc. Even on trips led by a number of us, I am the logistics/budget coordinator. That doesn’t mean I do more work — the others have unenviable jobs of dealing with sick students (sometimes taking them to the ER), handling lost passports, or various tasks. But the work is worth it, in some ways I enjoy traveling while teaching more than I would enjoy leisure travel. It is extremely rewarding to be able to watch students learn another culture, to share what I’ve learned about Germany or Italy with them. To learn about art and music from my colleagues on the multi-faculty trips, expanding my knowledge, with all of us seeing connections between the disciplines that we hadn’t before. I think the second trip to Italy we were heading out for a walk after checking in to the Venice hotel. We make sure the students stay up until at least 10:00 the day we arrive so they can get their body clocks adjusted to European time. We were heading out and then I heard a commotion, “look at that!” I looked – but saw nothing out of the ordinary. 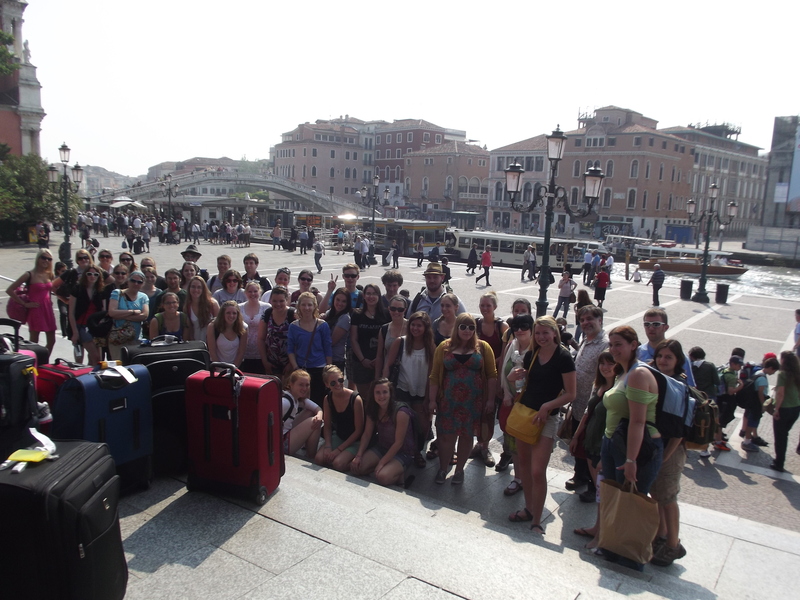 The students zoomed by with cameras and started taking pictures of the canals. Then I realized – I had been to Venice enough that the canals seemed ordinary to me, but through the students I could see them again as if for the first time. That keeps the experiences fresh – though it is cool to know that I am quite familiar with how to navigate Venice, Florence and Rome! 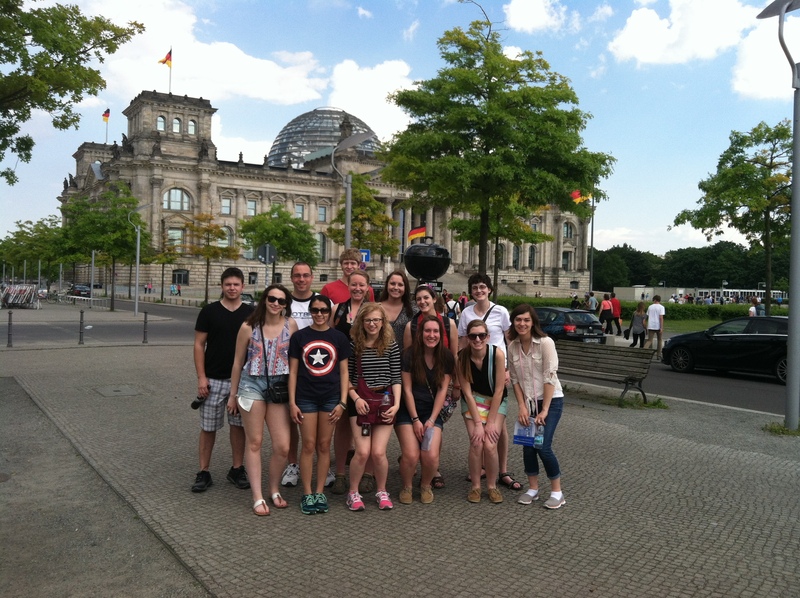 Above – 42 students and 4 faculty made our 2011 trip the largest! Some students have never been out of the country; we’ve had at least one who had never been on an airplane before. Some have traveled before. But we always develop group bonds, traveling together and sharing two weeks. When it ends people vow to keep in touch and not lose that connection. Alas, people do go their separate ways, but there is always talk of alumni trips or people coming back to travel again. 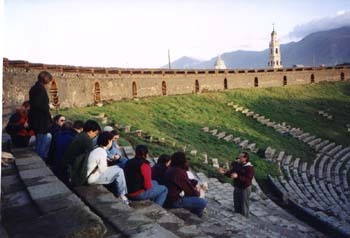 For many these travel courses are a life changing experience. 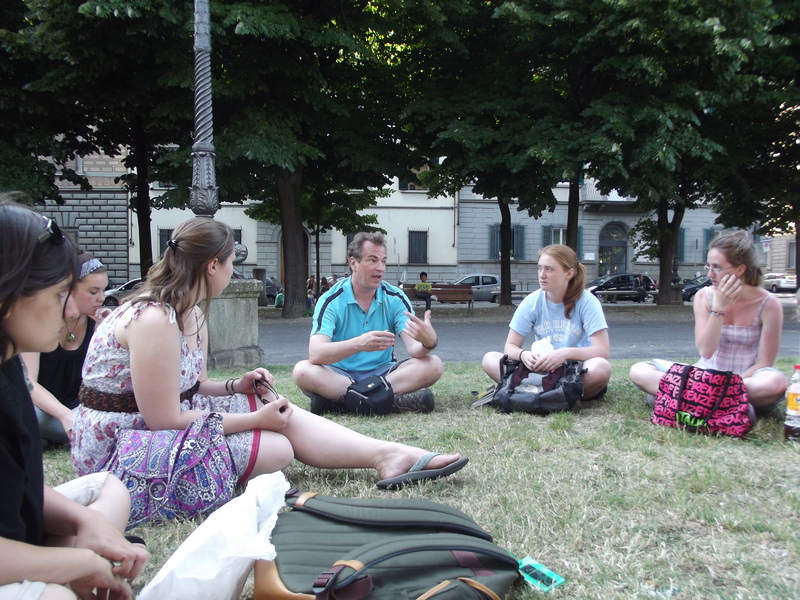 Me during the 2011 trip, at a park in Florence as we broke into groups to discuss various questions connecting course themes. So Monday I leave with 13 students for Berlin, flying Aer Lingus via Dublin. The course is “German Political History,” and we’ll include Austria with the Vienna visit. Everything is arranged, the weather looks fantastic, and all I have to do is pack and hope that everyone makes it to the airport without a hitch. Hopefully I’ll find some time to blog during the next two weeks (during the 2011 Italy trip I kept a pretty extensive blog). So now I have to get in my grades by Sunday, pack and be ready! I will try to blog while underway! 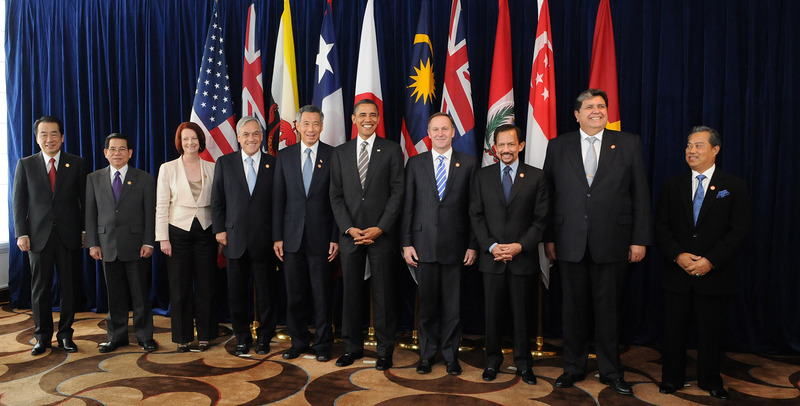 In 2005 Brunei, Chile, New Zealand and Singapore formed the Trans-Pacific Strategic Economic Partnership Agreement with the idea of integrating the economies of countries on both sides of the Pacific. The US joined in 2011, and now negotiations are underway to expand the zone to include Australia, Canada, Japan, Malaysia, Mexico, Peru and Vietnam (as well as the original four and the US). Other countries, such as Taiwan, the Philippines, Laos, Cambodia, Indonesia, Bangladesh, India, Columbia, Thailand and China have expressed interest in joining. Many on the left oppose expanding this agreement, arguing that it would harm the US economy by exposing us to competition from third world countries that pay their workers less and have laxer environmental regulations. The argument is that this further empowers global corporations to evade democratic oversight and prosper at a cost to American workers. 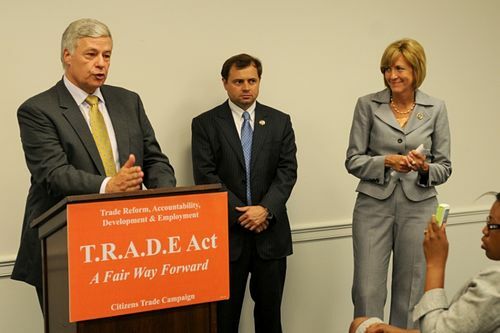 Maine Congressman Mike Michaud also urged President Obama to bring up alleged currency manipulation by Japan in negotiations with Japan’s Prime Minister Shinzo Abe. Japan’s currency has been deflating despite economic growth, and it appears that this is intentional. Yet given the near 25 year stagnation of the Japanese economy, I’m not sure turning this into an economic conflict does anyone any good. Joseph Stiglitz, one of the top economists on the planet, has warned that this agreement benefits the very wealthy, and will contribute to the increasing concentration of wealth in the world. By trying to push this through on a “fast track” trade agreement (meaning a bill written by the White House could be sent to Congress with no possibility of amendments or alterations), President Obama is likely to anger the left wing of his party. Indeed, anything sent to Congress will likely be after the 2014 elections so as not to arouse controversy during the mid term campaigns. So is Obama becoming a tool for big money, showing that once in power Democrats like Republicans serve the rich and powerful, or is the trade agreement good for the economy and US national interest? Alas, the answer is not easy, nor can it be reached with the usual ideological arguments. Yes, this is good for big corporations, and in my opinion we are in dire need of a global regulatory scheme to put big money under some form of accountability other than “the market.” Markets aren’t magic, and in fact can be easily manipulated by the very powerful. Yes, this could create difficulties for workers facing new competition. Yet globalization is real. The greater the connections between countries, the better the world economy will become. The production possibilities frontier will expand, third world states will use first world markets to grow their own markets, and global economic growth will pull us out of the current recession/crisis. The risks of not expanding global markets in a time where we face high debt and stagnant growth are greater than the threat to American workers. The way to insure a “fair” globalization is not to try to stop cooperation between states, but to use NGOs and social media to expose ways in which the system is rigged and create a movement for change. That won’t come easily because the system is still stuck in the mode of the old sovereign state schema. The system is obsolete, in a state of transition, and change won’t come fast enough for idealists who see the problems. The answer isn’t to try to stop change, but to work to guide it. 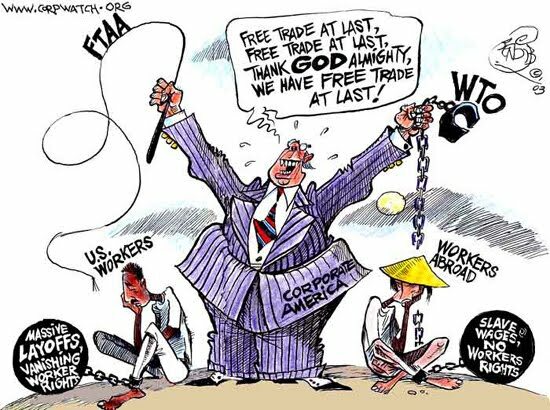 So I favor the TPP – Trans Pacific Partnership. I favor expanding trade and global cooperation. Yet that is not enough; we must also build stronger international institutions to protect workers and the environment, and expand democratic accountability. 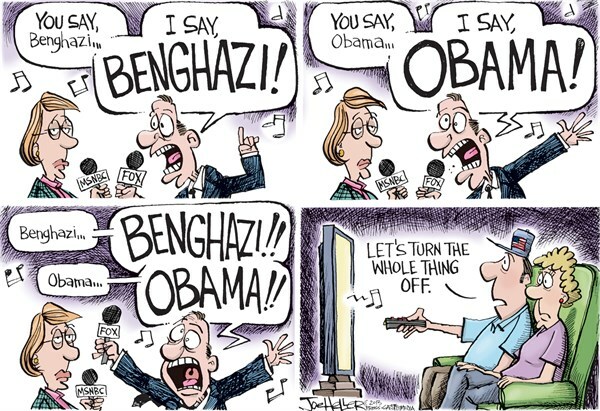 To be sure, I’m keeping my mind open and will listen to alternative arguments. This is not an easy issue. 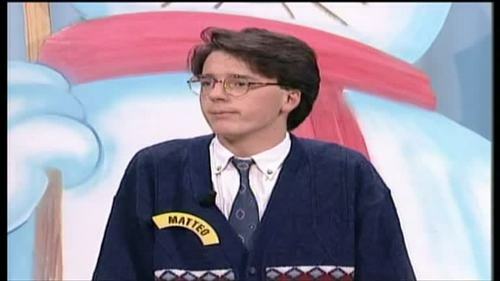 In the early 1990s the Italian political system underwent a complete collapse. Every party disintegrated or was renamed. Former Prime Minister Bettino Craxi, once considered the most powerful man in Italy, died in exile in Tunisia. The cause of the collapse was the Mani Pulite or “clean hands” investigation started by Milan magistrates, which led to the discovery of massive and pervasive corruption callend “tangentopoli” or bribery city. By 1994 Italy was said to be entering its “second republic.” From the end of World War II to the 90s the Christian Democratic party dominated Italian politics. While the country had over 40 governments, making it appear to be in constant crisis and unstable, the problem was the opposite: Italy was too stable. The insiders shifted coalitions and positions, but the same people dominated, becoming more and more corrupt over time. Italians knew what was happening – there was real scorn for “la classa politica” – but seemed powerless to stop it. The system broke down just as other single party systems fell part – Communism, the LDP in Japan, and the PRI in Mexico. With the internationalization of global capital, countries had to shed their isolated corruption to be relevant in the world economy. Yet hope for a new system in Italy faded; while many of the old guard left, the new leaders were still of the old thinking. Silvio Berlusconi dominated Italian politics and did not institute real change. Even reformers like Romano Prodi found it hard to take on a system that had been built on kickbacks and inside deals. By 2009 the glaring deficiencies of the Italian system came into full view as Italy fell into a crisis that threatened its ability to maintain membership in the Eurozone. 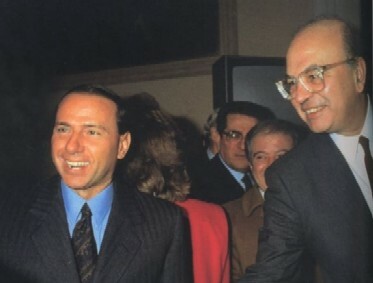 In 2013, as the country struggled to implement needed reforms, Enrico Letta became Prime Minister, leading a large coalition. The idea was that together the parties could do what was necessary to get on track. Yet progress was slow, people were losing patience, and under pressure Letta resigned in February 2014, allowing the young Matteo Renzi to be named Prime Minister. Italy has a multi-party system, and Renzi’s left of center Democratic party controls 293 of 630 seats in the national assembly, and 108 of 320 in the Senat. In order to govern it has formed a coalition with seven other parties. Renzi’s task is to implement reform while keeping that coalition together. Renzi has argued that Italy needs generational change – that the old system will never truly be open and transparent if the old guard remains in power. 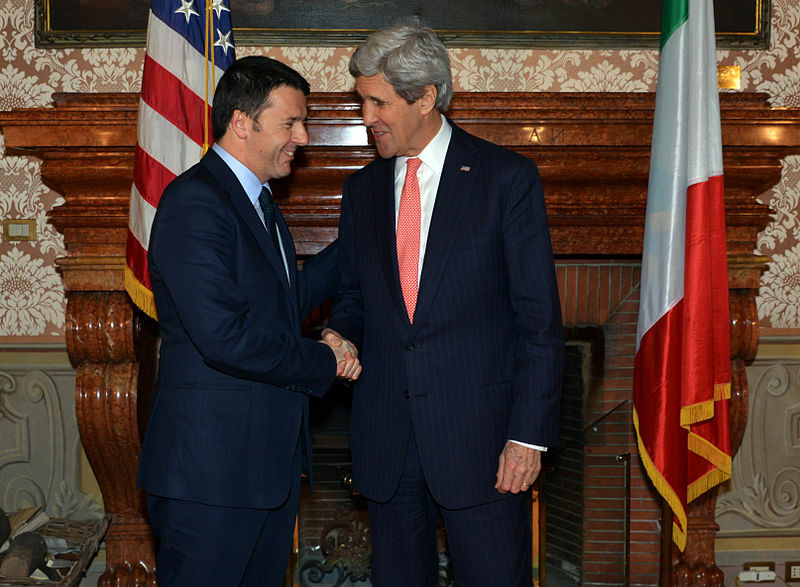 His cabinet has an average age of 47, younger than any in Italian history. He already has forced the resignations of leaders of the largest state owned companies, replacing them with women. That alone is a culture shift – women never ran any of those companies before, and Italian business has been male dominated. 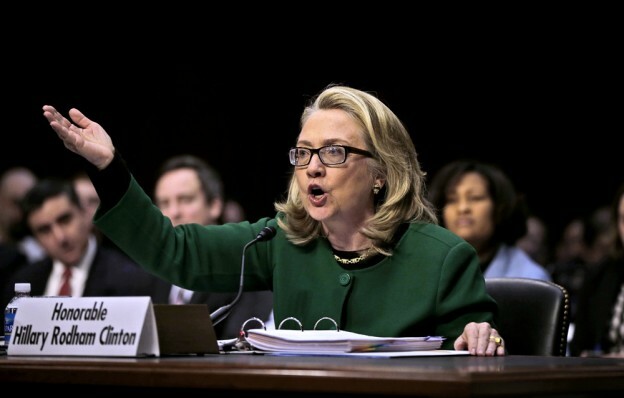 His ideology is said to be close to Tony Blair’s “third way” – center-left, with an emphasis on the center. His first three year budget has controversial provisions, but is designed to create long term growth potential. Italy’s economy is not exactly healthy. In 2013 its economy contracted by 1%, with unemployment over 12%. It had a budget deficit of minus 3.3%, with total government debt at 133% of GDP. 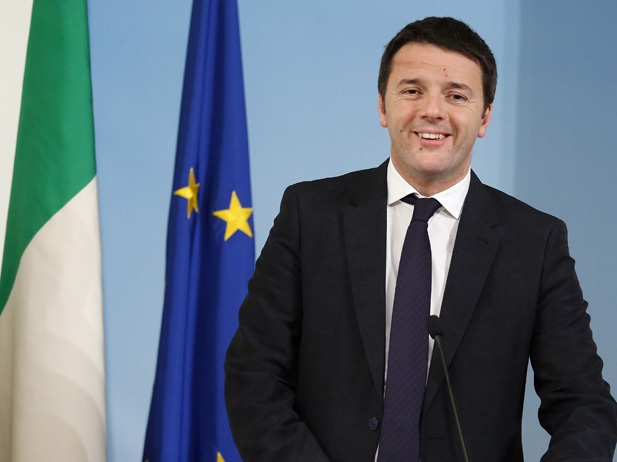 To succeed Renzi has to get the deficit below 3%, grow the economy, and lower unemployment. To do all that he must not only craft a solid economic plan, but more importantly remake “la classa politica.” For generations the political class has been corrupt. That has to end. A new generation has to make links with the other European economies and build a new civil society. Faced with corrupt leaders, citizens had no qualms about tax evasion, cheating the government, or trying to get for themselves whatever they could. Civil society was weak. None of that can be changed overnight. Renzi offers a breath of fresh air and a sense that a mixture of crisis and impatience may be enough for Italians to now build a true modern democracy based on rule of law and accountability rather than inside deals and kickbacks.